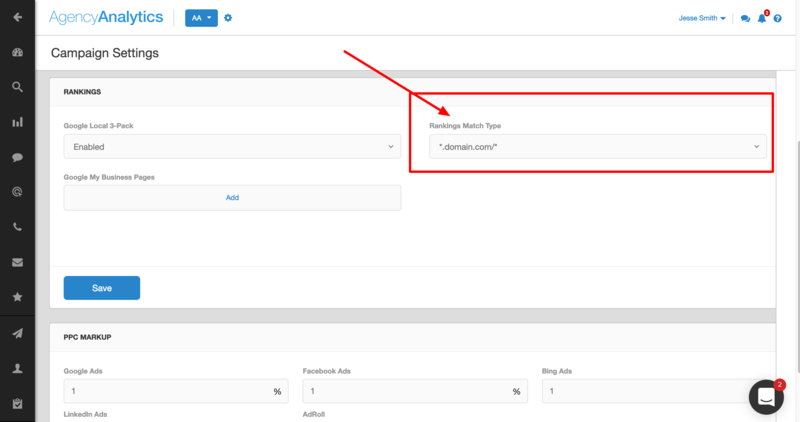 Match types determine which pages on a site are eligible to be reported in the rankings module. There are two ways to configure match types. From here, click to select which match type you prefer. For any of these settings, start in the SEO --> Rankings section. To change the URL that's being tracked for the campaign, follow the instructions in this article in this article. To adjust the match type setting itself, click the "Settings Slider", then click "Edit". This will open the Rankings settings for editing. Next, click the drop down next to "Match Type" and select your desired match type for this campaign, and click "Save" when finished.